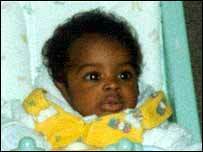 Police want a man who called them about the abduction of a baby in London 14 years ago to get in touch again. The man, said to be "African sounding", told police five-month-old Ames Glover was taken to Ghana on the day he was snatched. The case was reviewed in 2002 and last year ?10,000 was put up for information leading to the abductors' arrest. Police want the man, who called on 8 October, to contact the incident room on 020 8284 8561. Ames was snatched from a locked blue Ford Sierra in South Road, Southall, west London, 5 February 1990, while his father Paul withdrew money and picked up a curry. On discovering his son missing, Mr Glover went into an estate agent's office and alerted police. Ames had been dressed in a blue and yellow coat, light green romper suit, with blue and yellow hat and blue bootees. Inquiries at the time failed to find the boy and this led to the 2002 review. Police considered constructing an image of what Ames might look like now, but a forensic artist told police that at five-months-old, Ames' bone structure had not developed enough to project what his face would be like now. Appealing for information last year, Ames' mother, Shanike Ondaatjie, said: "It's not been easy these last 13 years. "I need to know what happened to Ames and I know someone has that nugget of information that would help the police, I would ask them to come forward. "I don't care if it's good or bad, I just need to know. "Sometimes I see young boys in the street and can't help but wonder if one of them is Ames, he would be 14 now and I have lived in the hope that one day I will find out where he is or what became of him."